5 Myths About Compression Exposed | JustRunLah! In recent years, we have been seeing more athletes and amateur runners wearing compression gears. While compression clothing sure adds onto the cool factor for athletes, there are many who have reserved doubts regarding the benefits compression promises. Fret not, we are here to debunk the 5 more common myths of compression for you! Many pro athletes use compression, but compression can provide the same benefits even for beginner athletes. The benefits of compression are not exclusive and is for anyone who wishes to improve their performance. For instance, the R2V2 Compressport Calf Sleeves help with limiting vibrations, reduce muscle damage, delay muscle fatigue, improve prolonged performances and prevent delayed muscle soreness. Moreover, wearing the R2V2 Calf Sleeves during recovery will increase the oxygen supply, eliminating toxins faster and preventing swelling. Whether you are a pro athlete or amateur runner, everyone deserves to use a quality product for your best performance. Compression gear such as Compressport products are made with light and breathable fibres for better thermoregulation. The brand new R2V2 Compressport Calf Sleeves are made from Ultralight material so it remains the most lightweight and optimises thermoregulation. 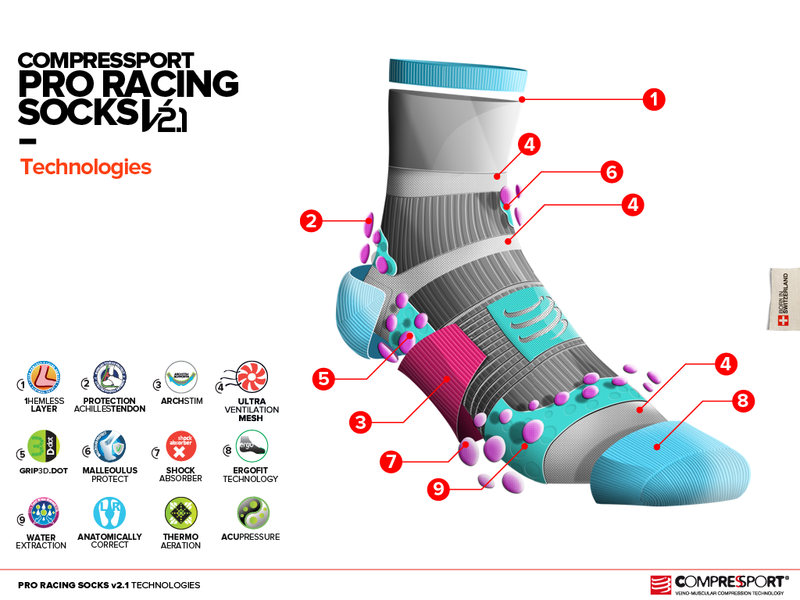 The Compressport Pro Racing Socks V2.1 also uses similar technology. The 3D.DOTS Technology enables moisture to be evacuated between dots and air to circulate freely so the user’s foot remains cool and dry. This allows the socks to be breathable, which help to remove humidity and sweat while also protecting against heat, the risk of overheating, blisters and fungal infections. Two recent meta-analysis* (based on 40 scientific studies on compression) related to sport compression have shown that using compression garments induces athletes’ better performances and recovery in any sport. In some minor studies which do not reflect any positive effects, the reason could be attributed to the use of unsuitable type of compression, for example when it is too strong or weak. Before, during or after a workout, your body needs different types of stimuli. Different compression products are designed for different purposes: to reduce the feeling of lightness before, for reducing vibrations and thus delaying fatigue; reducing risk of injuries during; and for faster recovery after. The key is to use the suitable product for its designed purpose in order to reach maximal efficiency. In fact, compression gear can be used in any sports, for better performance and protection against injuries. A scientific study carried out on more than 1200 sportsmen and presented to the last International Olympic Committee (Monaco 2014)* has shown a significant reduction in risk of injuries (29%) when a sportsman always and rigorously use compression during his training and competitions. 10% Discount for Compressport Run 2016 for our readers! 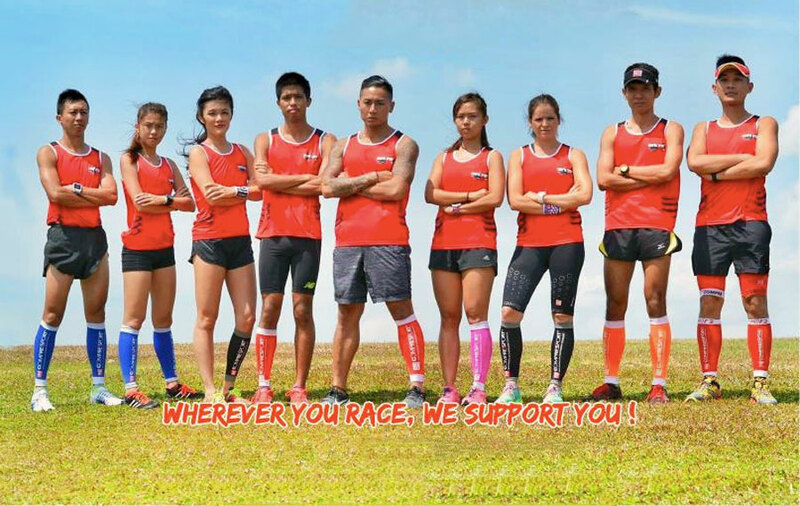 Great news for you guys: all 10km runners are entitled to a pair of Compressport R2V2 calve sleeves (worth $79), while all 5km runners are entitled to a pair of Compressport Pro Racing Socks V2.1 (worth $29)! On top of of that, all JustRunLah! subscribers can get a 10% OFF with promo code: CR2016JRL10. Simply key in the promo code during check-out to claim the special price.